My aunt called us all on December 23rd to confirm that she had electricity at her house and the party would proceed as scheduled. This annual birthday party has recently been upped from a bi- to a tri-, since my cousin's new husband has a birthday around Christmas just like my mother's mother (Bubbe) and Ken. I arrived early to help my aunt with last-minute preparations. This consisted of setting the table (twelve chairs crammed around a table that can comfortable accommodate six - it gets a little cozy), and then keeping an eye on Pepper to make sure he didn't do any table-arranging of his own. This is Pepper. He's a good boy. Pepper says: "Mrow? Mrow? Mrow? Mrow?" which translates roughly to: Pay attention to me I can haz pats? I can haz salmon? I can haz salmon? I can haz salmon? 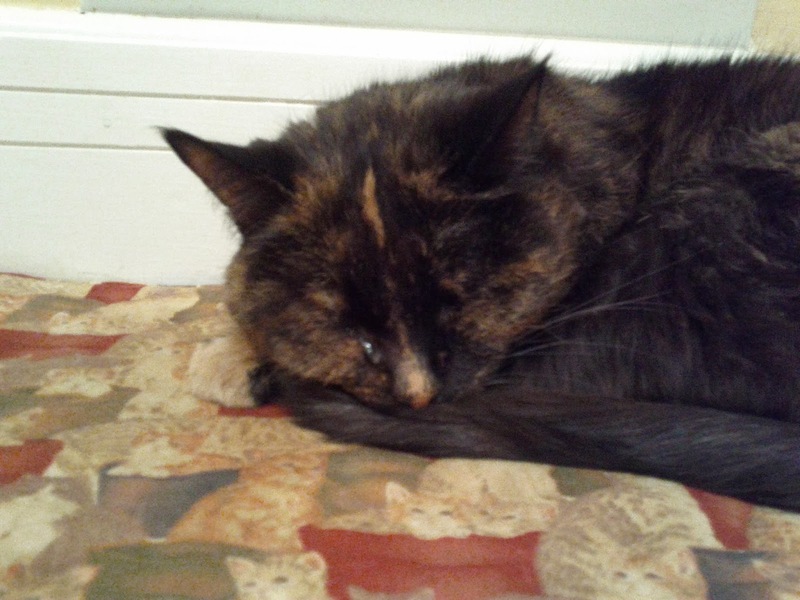 Nutmeg is an old lady and spent the evening snoozing on her pillow by a heating vent. This is Nutmeg. My aunt refused most of my offers of help in the kitchen because she was too disorganized and panicked to do more than one thing at a time. Dinner was a little delayed on account of the chaos, but that was no problem. When it was finally served (rice with fried mushrooms, green beans, butternut squash, and, obviously, salmon) it received rave reviews. My Bubbe was pleased. This is my Bubbe. 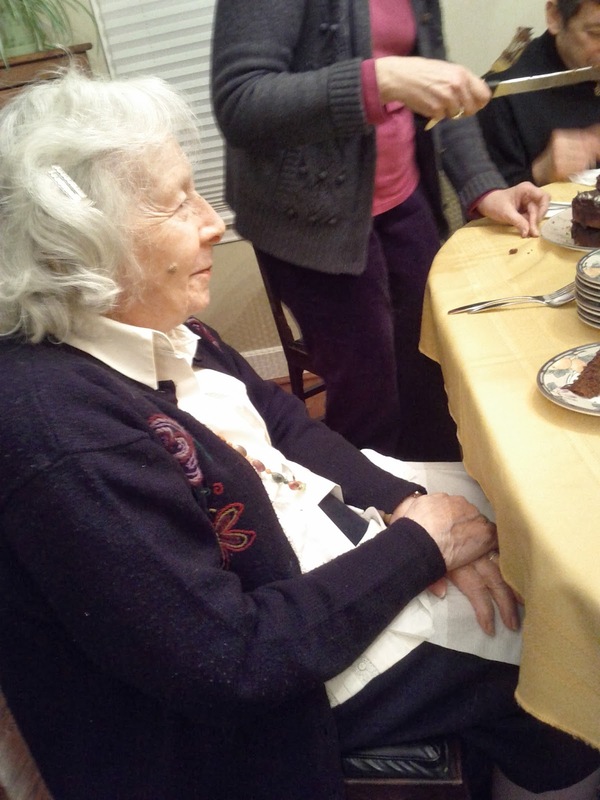 It was her 93rd birthday. She's looks good for her age, doesn't she? Also, she looks a lot like The Queen. Don't you think? This is The Queen. They have the exact same nose! Isn't that freaky? Just slap a little lipstick on my Bubbe, and an enormous red hat, set her hair, and throw some pearls on her, and there would be nothing to distinguish them. MY BUBBE AND THE QUEEN ARE TWINS SEPARATED AT BIRTH. Don't tell anyone. It's a secret. In the end, Pepper did not get to taste the salmon, but he did get a lot of pats on the head. And now that I have resolved the only dramatic tension in this non-story... THE END. I was on the edge of my seat awaiting the climactic resolution of that arc. But since Pepper did NOT proceed up Maslow's Hierarchy of Needs, it's a tragedy, and our hero is not better off than at the beginning. On the other hand, secret royal twin Bubbes are awesome. Hope you had a Merry Christmas, Spark! Well, Bubbe's Halloween costume is settled for next year! DarcKnyt: LOL at Maslow's Hierarchy of Needs. Poor old Pepper. But perhaps I spoke too soon. 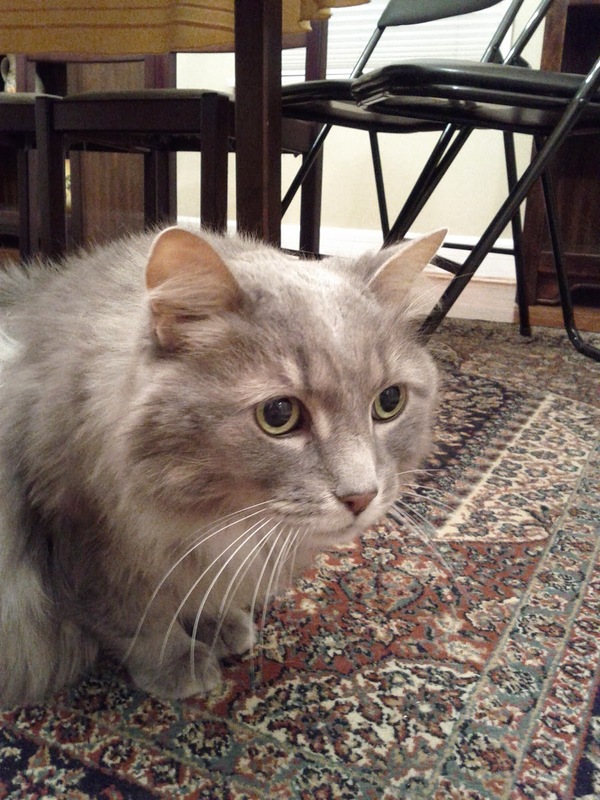 He didn't get any treats while I was there, but my aunt may have given him something after we all went home. Ron: A princess, eh? I need to work on my sense of entitlement. Jenski: She has the royal procession hand wave down pat. Ness: Even thought Pepper's a boy, my aunt refers to her cats as "The Spice Girls". Lynn: Isn't she cute? I like how she looks with all-white hair. She used to colour it a kind of gold-blond shade, but I like it just as much au naturale. Hi Spark, I haven't been here in ages! Love the pics of your family and the cats. Oh my goodness your Bubbe is awesome! It's great to see a pic of a lady who has graced so many posts. Happy New Year! Just carry that picture of the Queen in your purse and say, this is my Bubbe. You could get by with it. I love seeing a picture of your Bubbe because we all love her you know. Now about Pepper and Nutmeg..you have given me a whole new selection of names for my many chickens. I was running out but now I simply will hit the spice rack and we will be having tarragon, sage, parsley and cinnamon, etc. Sorry to be so late getting here. Happy New Year! Cool story and cool pic of your Bubbe.